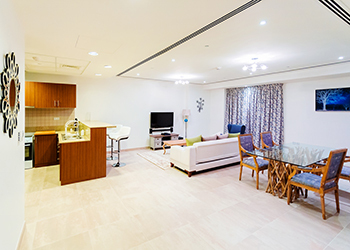 Holiday homes ... Grayscale did the fit-out of villas at JBR in Dubai. The entire site covers approximately 28,100 sq ft, featuring 21 apartments in a bold variety of colour schemes, styles, and layouts. Grayscale Interiors’ scope of works under the Dh2.5-million ($280,500) contract covered furniture, fixtures and equipment (FF&E) and operating supplies and equipment (OS&E). The company was handed over the site in a standard built state: namely, walls, floors and ceiling including built-in joinery for wardrobe and kitchen. “Grayscale had four team members onsite with our work mostly involving co-ordination and lead time management for deliveries due to most items originating from various quality vendors and subcontractors,” says Dr Gary Vastag, the founder and managing director at Grayscale Interiors. 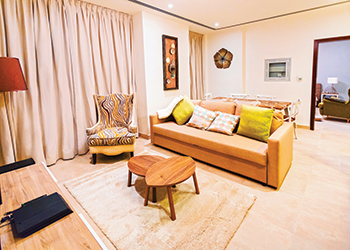 Villas at JBR ... bold variety of colour schemes, styles, and layout. “I personally handled the client relationship management to ensure project parameters were satisfactorily met,” he adds. According to Vastag, Dubai Properties’ brief was to deliver a ‘home away from home’ end-user experience through design and furnishings. “This led to substantial sourcing, as each style of apartment required a distinctive personality and living experience. Various items, such as electronics and bedding, were sourced from the same suppliers,” he adds. Grayscale Interiors specialises in providing interior commercial fit-outs, refurbishments, and retrofits. With a portfolio that spans work with businesses across multiple sectors, including corporate offices, hospitality, education, residential developments, and retail outlets, the company takes pride in ensuring that clients are presented with the best possible construction bespoke solutions. Founded in 2013, Grayscale Interiors operates out of Dubai and currently boasts a project roster that includes Saudi Arabia, Qatar, and the UAE. In June 2016, KBW Investments acquired a majority stake in the company to facilitate its growth and scale across the Middle East and North Africa (Mena) region and further afield.